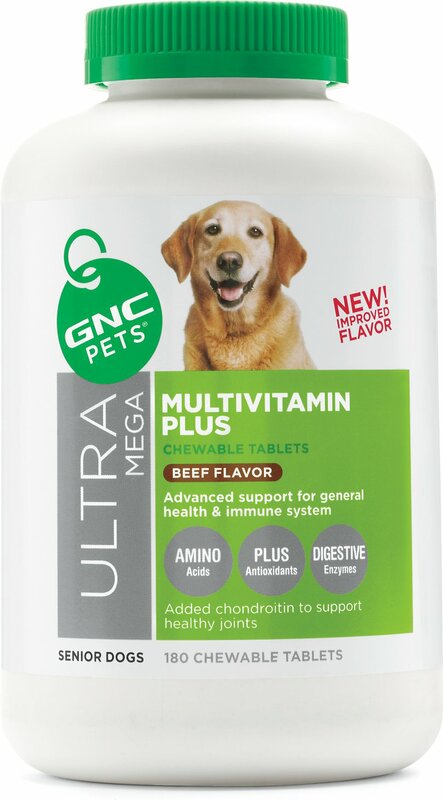 Supplement your senior dog's diet with GNC Pets Ultra Mega Multivitamin Plus Senior Beef Flavor Chewable Tablets Dog Supplement. These tablets offer advanced support for general health and your canine's immune system—and they're chewable, which makes them easier to feed than pill supplements and vitamins. Plus, with cellulose, alpha-Amylase, lipase and papain, this multivitamin packs a nutritional punch that's unique to the needs of senior dogs. Now you know you're giving your pup a multivitamin that covers all the bases. So, go ahead—score a home run with GNC Pets Ultra Mega Multivitamins. Formulated with high-quality ingredients to help support your senior dog's general health and immune system. Nutrition specifically synthesized for the health of senior dogs. Dog-friendly tablets turn a supplement into a tasty treat—your pup will have no idea they're eating something good for them! Chewable tablets are an awesome alternative to pills, making it easier to supplement your dog's overall health and wellness. Dicalcium Phosphate, Microcrystalline Cellulose, Whey, Poultry Liver, Bovine Trachea Powder (Natural Source Of Chondroitin), Brewer's Dried Yeast, Ascorbic Acid, Choline Bitartrate, Stearic Acid, Taurine, Calcium Carbonate, Sodium Ascorbate (A Preservative), Dl-Alpha Tocopheryl Acetate, Calcium Silicate, Potassium Chloride, L-Lysine Hydrochloride, Magnesium Oxide, L-Cysteine, L-Aspartic Acid, Glycine, L-Threonine, Dl-Methionine, L-Proline, L-Serine, Ferrous Fumarate,Manganese Gluconate, Niacin, Thiamine Mononitrate, Flaxseed Oil, Calcium D-Pantothenate, Inositol, Magnesium Stearate, Silicon Dioxide, Dried Beef Powder, Cellulose, Gelatin (Fish, Bovine), Pyridoxine Hydrochloride, Beta-Carotene, Riboflavin, Dried Aspergillus Niger Fermentation Product, Corn Starch, Zinc Oxide, Dried Aspergillus Oryzae Fermentation Product, Gum Arabic, Maltodextrin, Cholecalciferol, Copper Gluconate, Sodium Selenate, Chromium Chloride, Sugar, Vitamin B-12 Supplement, Biotin, Potassium Iodide, Folic Acid, Methylcellulose, Dried Rhizopus Oryzae Fermentation Product, Dl-Alpha Tocopherol (A Preservative), Vegetable Oil, Papaya, Sunflower Oil. I started giving these to my dog almost 4 years ago. I just thought a good multivitamin was a good idea and decided on this one after some research. What a difference! Within a a month or two her coat and nails had drastically improved, she has more energy, and she doesn't shed nearly as much. And for a husky that is amazing. These multivitamins have helped our dogs so much. Our dogs like the taste of the vitamin so you don't need to disguise it in a treat, it is part of our morning routine.